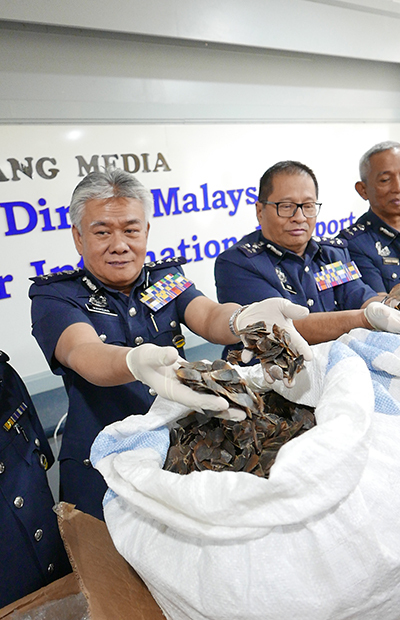 Last month, within a matter of days, alert customs officials at Kuala Lumpur’s international airport seized two giant hauls of pangolin scales, which had been flown in from Africa and weighed 712kg in total. This month they discovered yet another giant haul of scales at an air cargo warehouse at KLIA. The scales, which weighted 288kg, had been flown in from Ghana and brought the total amount of scales seized within a month to more than a ton. The scales had been packed into gunny sacks and stored in 12 boxes, which had been falsely labelled as oyster shells. They would have been worth 3.7 million ringgit ($870,000) on the black market. The Malaysian address given on the airway bill was fake. And then, a few days later, officials at KLIA discovered yet another shipment of pangolin scales. This time the scales weighed 394kg. They, too, had originated in Accra in Ghana, just as previously. To sum up: four large shipments of scales within a few short weeks. These seizures of scales show that the mass slaughter of African pangolins continues unabated. Sadly there’s little surprise in that. Recently, TRAFFIC warned in a report that wildlife traffickers have been switching from Asian pangolins to African ones in an effort to meet unrelenting demand for pangolin scales in countries like Vietnam and China, where they are used for medicinal purposes even though pangolin scales have no known curative properties. As much as four-fifths of scales that have been traded illegally since 2010 have come from African pangolins, TRAFFIC says. The anti-poaching group has commended Malaysian authorities on their latest successes in seizing illegal shipments, but added that these same seizures prove that international wildlife trafficking syndicates remain unrelenting and continue to use the country as a transit point with impunity despite stepped-up efforts to eradicate wildlife trafficking. Nor is Malaysia the only country in the region where the trafficking of pangolins is endemic. Right about the same time Malaysian authorities discovered those large hauls of scales from Africa, their Indonesian counterparts managed to seize scores of the animals that were still alive, as well as a large amount of scales in nine large sacks. They did so by raiding a warehouse near a port on Sumatra, where they found 223 live pangolins. Another 24 of the animals had already perished by then and were kept in a freezer so as to preserve their meat, which is prized as a delicacy by some people. Make no mistake: Catering to that demand is a highly lucrative business. Poachers and traffickers can make a fortune selling the endangered animals. Larger shipments can fetch hundreds of thousands or even millions of dollars on the international black market. 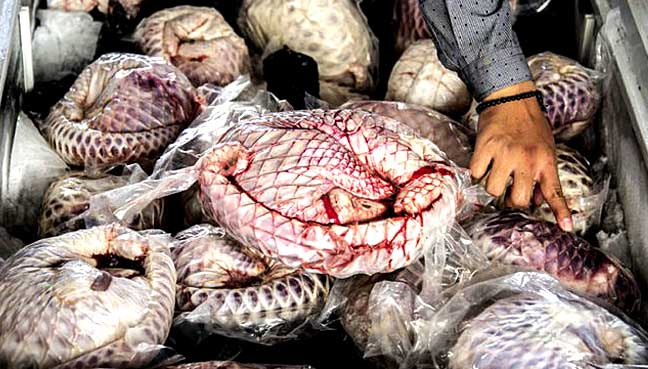 According to Indonesian officials, who arrested two local traffickers, the recently seized haul of pangolins and their scales were bound to be sent over to Malaysia, from where they would likely have been sent on to Vietnam or China. That’s why cross-border intelligence-sharing operations are vital if we are to roll back the extensive networks of wildlife trafficking, which have decimated species like pangolins worldwide. Poachers and traffickers know no borders and act with brazen disregard for national and international laws. As a result, all eight subspecies of pangolins are now critically endangered and the animals have been dubbed the “world’s most trafficked mammal.” Their populations have declined by as much as 80% over the past few decades. Pangolins may appear invincible in their scaly armor, which can withstand the bites of predators like tigers, but they are defenseless against poachers’ snares and weapons. They are shy and retiring creatures that spend most of their time curled up in balls within their borrows. They come alive at night when they begin to forage for insects. Poachers usually trap them by following their distinctive paw prints or by using dogs whose acute sense of smell can locate them with relative ease. Each year an estimated 100,000 pangolins are poached and trafficked worldwide. Over the past decade as many as 1 million of them have been taken from the wild, driving their populations ever closer to the edge of extinction. Pangolins once thrived across Asia and Africa and have survived for millions of years. Now they are at death’s door in the wild everywhere. And that’s simply because many people in countries like Vietnam, China and sadly even Malaysia fancy a bite of their meat or assume that their keratinous scales can cure them of certain ailments. A terrible shame, that. Human greed and folly are an awful threat to pangolins.